Shizen-fu is the name given to cloth woven from plant fibers as opposed to synthetics such as nylon. Since long before cotton started to be produced here in Japan and became familiar in the mid-Edo period (18th c.) people have been taking fibers out of whatever plants they can find in their neighborhoods, spinning them into yarns and weaving them into cloth, for thousands of years. In Japan, cloth appeared back in the Jomon period (8000 to 400 B.C.). At first it was knitted, then eventually it started to be woven using a warp and weft. Ramie nettle, hemp, wisteria, kudzu vine, linden and paper mulberry have been widely used. Additionally, ohyo (elm) has been used in Hokkaido and banana fiber in Okinawa. As paper started to be produced, paper string was also used as yarn. It is extremely tough work to peel bark. Then it must be boiled to soften it, and the fibers removed, and spun into yarn. In the case of ramie or hemp it is also very tough work to make them into cloth. Most of such work has been done by women and it is they who developed ways of making those tough materials comfortable to wear. Shizen-fu (natural fabrics), the result of such hard work, bear each plant’s unique qualities in their distinctive texture and natural charm and exude the power of ancient techniques. 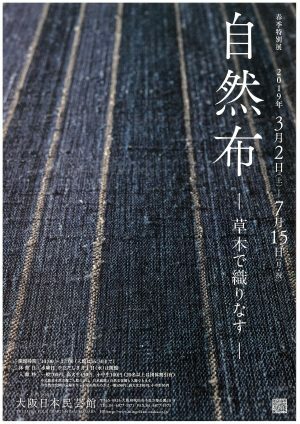 This exhibition presents some 70 works of plant fiber textiles from various parts of Japan. Please enjoy the world of natural plant fiber cloth in which you can appreciate both the bounty and great hardship of nature.